After three months and three Freedom of Information requests, Highways UK have released the slide below to me. This is all, in terms of route appraisal, that's required to convince the A27 Reference Group and the Government that a new dual carriageway between Lewes and Polegate is, suddenly, value for money and of economic benefit, at £450m, when all previous reports have shown otherwise. Highways UK, for all their £3m consultancy costs, seem unaware that there's a second Arlington Reservoir coming; presumably they can afford a bridge or something. You wouldn't put it past them to assume a new speed limit to speed up the journey times. Rupert Clubb, running transport and a lot of other things for East Sussex County Council, actually lives in West Sussex - on the old A27 in the hamlet of Crossbush, by-passed some years ago. His journey, if by car, to his Lewes HQ would take around 40 minutes. He likes cycling, but I suspect doesn't often used two wheels in the week - using part of National Cycle Route 2, it would take nearly two and half hours. Surely, more than ten years into the job, he's sorted a public transport route ? Just under two hours along the South Coast, on three trains. Not much slower to go from Arundel up to Gatwick and back out to Lewes. I'm guessing he drives - with a nice parking space in that central courtyard off St Anne's Crescent. Delighted to learn that Rupert Clubb has time free in November to talk at Highways UK, "the flagship event for the people and organisations involved in the planning, designing, building, operating and future-proofing of the UK's road network." Rupert is Director of Communities, Economy and Transport, East Sussex County Council and the immediate Past President of ADEPT, the Association of Directors of Environment, Economy, Planning and Transport. He's always wanted a dual carriageway between Lewes and Polegate, despite all previous expert analysis saying such a road was poor value for money, likely to damage the landscape and biodiversity. In the introduction to his talk to road-builders, he writes: "The Transport Investment Strategy sets out a vision for our roads network that recognises that we must fundamentally put the user at the heart of the decisions we make. It makes strong reference to the importance we must place on our environment and well-being. It is uplifting to see these words set out in a transport strategy document. This strategy gives weight to the view that done well, done sympathetically and done with our communities and businesses we can bring about benefits that are more than just the time it takes to get from A to B. It presents an opportunity to shape housing development, improve prosperity and to capitalise on new and emerging technology." 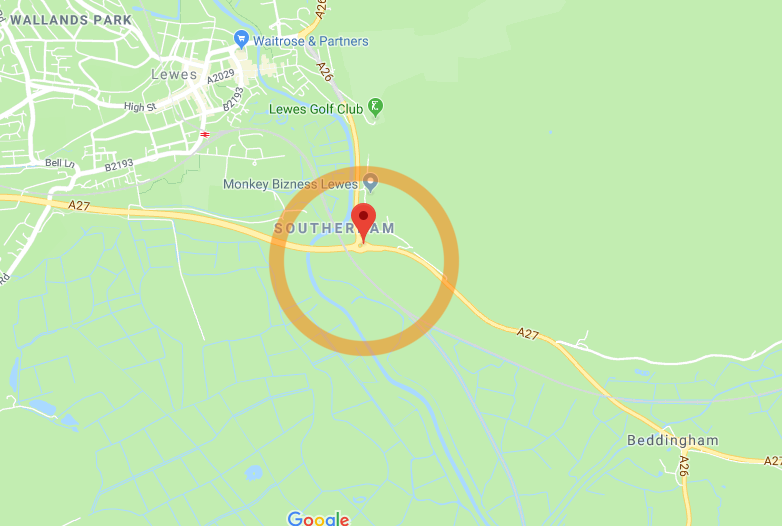 The proposed A27 East of Lewes doesn't even do much for the time it takes to get from A to B, never mind all the rest of the 'uplifiting' blah. To get a flavour of the Clubb style, here's Rupe at a previous Highways UK event in May, sponsored by construction firms Balfour Beatty, Costain, Elgin Roadworks and Jacobs. 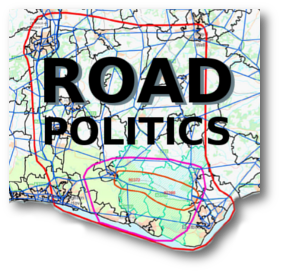 East Sussex County Council, like Highways England, don't think we - residents, voters, ordinary people - should take part in the real planning of new roads. 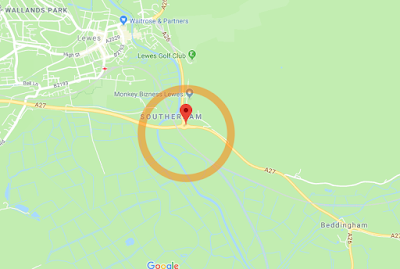 They're spending £3m of Government money, with the approval of the Transport Secretary, on 'proving' that a new dual carriageway section of the A27, running east of Lewes towards Polegate, is a good idea. All previous studies have shown that such a road is poor value for money, low in saving journey time, and would have a large detrimental effect on both the landscape and bio-diversity. They take comfort from an online survey in which less than 300 people said a new dual carriageway would be a good idea - that, remember is 300 people who haven't seen any real plans. Now, in the marvellous chicken-and-egg world of Conservative politics, they're trying to demonstrate that the 'demand' for new houses in Greater Eastbourne and along the A22 will make the road inevitable. Nonsense. Conservative councillors love builders; their company, their money, their political support. If they loved jobs and public service a little more, they could perhaps define the new jobs where all these new home-owners will be travelling to and from, then we could work out where we need houses and roads. So, in response to my latest Freedom of Information request, we have redacted minutes from the self-selecting A27 Reference Group, meeting at the heart of the community (Portcullis House, Westminster) trying to railroad this dual carriageway through the system, and refusing to share any maps. Why are developers so keen on new build opportunities in East Sussex ? In the year to date, the average price of new build homes recorded by the Land Registry across the county was £373,430. In Northumberland, it was £243,941. It's all about margins. Since Highways England say we can't be trusted with maps, let's make up a few of our own. The average dual carriageway interchange takes 1km in every direction, to allow cars 0.5km to slow down on slip roads. 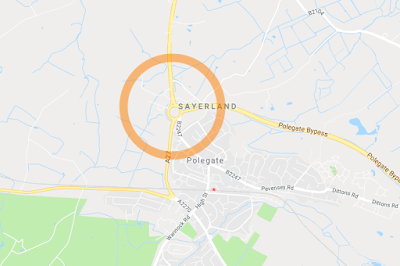 Here's a 1km circle around the Southerham Roundabout, and another round the Cophall Roundabout. Both new interchanges will require 'three-lane-flares'. They'll look nice in the landscape, won't they ? .....to a blog that, I hope, will shine a light on how decisions about new roads are really made. I live not far from the A27 between Lewes and Polegate. Most of it is single carriageway, and it gets a bit bunged up at peak times, as you might expect, and accidents can cause more problems. But, compared with many roads I've travelled, it's not an enormous headache, except for the sort of driver that can't be bothered with indicators, if you know what I mean. £75m is currently being spent on improvements, but a group of Tory MPs and councillors, working in collusion with Chris Grayling, have nicked £3m of that to spend on studies proving £450m for a new dual carriageway is, desite the conclusions of all previous studies, great value. And they don't want to be disturbed while they're doing it. You can follow my FoI requests on the website What Do They Know ? My name's Bill Rogers. I moved to East Sussex in May 2017 - I thought to the countryside. Now the road lobby and their politicians are trying to build a new dual carriageway that could go right past my house. I'm pretty grumpy. 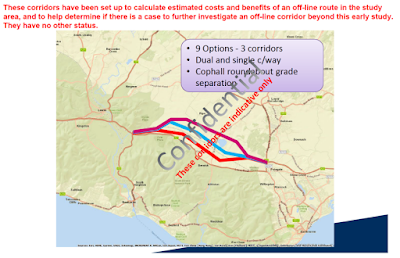 In May 2018, Maria Caulfield, Conservative MP for Lewes said that the 'A27 Reference Group', operating out of East Sussex County Council, had developed a case for a new section of dual carriageway between the Southerham Roundabout at Lewes and the Copthall Roundabout at Polegate. They were pushing forward for Government funding, expecting a decision in 2019. It's all being done behind closed doors. Who selected the Reference Group, and who gave them £3m to spend on their case ? All previous studies said a dual carriageway was poor value for money, saving only 4 to 6 minutes on journey time. Nowhere can I find work on improving public transport to ease pressure on the existing road. Southern Rail have been allowed to cut services - and average journey time Lewes to Eastbourne is now 24 minutes, not the 20 minutes claimed on roadsigns. Highways England won't share the new economic case, maps of possible routes and environmental assessments, saying they need "safe space away from public scrutiny to conclude their work." All in all, local residents have no obvious voice in this process. SWOT - Facebook page for "Save Wealden from Overdevelopment Team"